The Battle of Horseshoe Bend took place in the Muscogee (Creek) country of what is now Alabama on March 27, 1814. A frontier general named Andrew Jackson faced off against a Red Stick chief named Menawa. For Jackson, it was the first significant step on his road to the White House. For the Creeks, it was the first step on the Trail of Tears. The battle was the climactic event of the Creek War of 1813-1814, a conflict that began as a civil war among the Muscogee people and spread when Mississippi Territorial Militia forces attacked a Native American supply party at the Battle of Burnt Corn Creek in the summer of 1813. That American attack brought the United States into the fierce conflict for control of the Creek Nation. The Red Stick faction of the Creeks, led by the Prophet Josiah Francis (Hillis Hadjo), was trying to seize control of the nation from the white-allied followers of the Big Warrior and Little Prince. When the militia attacked their supply party at Burnt Corn, the Red Sticks retaliated by destroying a frontier stockade named Fort Mims. More than 250 men, women, and children died in the attack, and the U.S. frontier exploded with fear and outrage. Horseshoe Bend National Military Park near Daviston, Alabama. The battle now turned into a bloodbath. Realizing that they were fighting for the independence, future, and lives of their people, the Red Stick warriors refused to surrender, and the killing continued into the night. Menawa, who was severely wounded, managed to escape with a few others during the night. Over 800 Red Stick warriors died on the battlefield. U.S. casualties were heavy as well. Jackson reported that his command lost 49 killed and 154 wounded. Many of the wounded later died. The results of the battle were stunning for the United States. The Battle of Horseshoe Bend broke the back of the Muscogee (Creek) Nation. Jackson’s army now swept into the very heart of the Creek country and built Fort Jackson where the Coosa and Tallapoosa Rivers unite. William Weatherford and many other important Red Stick leaders surrendered, although the Prophet Francis, Peter McQueen, and others escaped to Florida. The Treaty of Jackson formally ended the war. It forced the Creeks to cede more than 20,000,000 acres of land to the United States. The cession included a vast swath of South Alabama and Southwest Georgia. The Prophet Francis and Peter McQueen had not been on the field at Horseshoe Bend. They now led the surviving Red Stick families south in a flight to hoped-for sanctuary in Spanish Florida. Resupplied there by the British, they continued to fight the United States in the closing phase of the War of 1812 and the First Seminole War of 1817-1818. Some eventually returned to their homes in the Creek country and their families were among those forced west on the brutal walk of the Trail of Tears. Others stayed in Florida where they assimilated with the Seminole and Miccosukee and fought again during the Second Seminole War (1835-1842). Andrew Jackson went on to defeat the British at the Battle of New Orleans on January 8, 1815. He served as Governor of Florida in 1821 and as President of the United States from 1829 to 1837. Menawa remained a leader in his nation for years to come. The battlefield is a sacred place today. The armies of the two nations fought there with courage and determination, each knowing that the outcome would determine the future of North America. 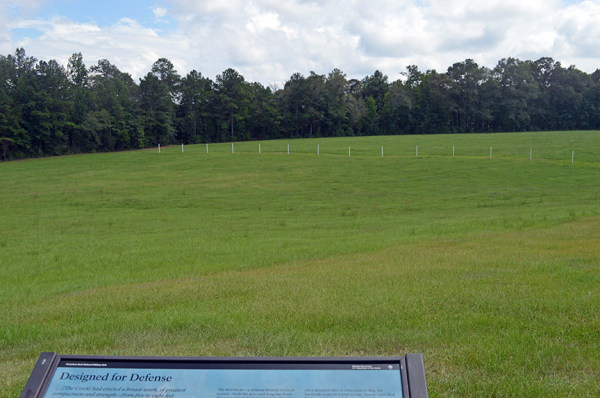 The ground where so many people bled and died is now Horseshoe Bend National Military Park. The park is on Alabama Highway 49 thirteen miles north of Dadeville. The address is 11288 Horseshoe Bend Rd, Daviston, Alabama. It features an excellent visitor center and museum, driving tour, hiking trails and interpretive displays where critical parts of the battle took place. 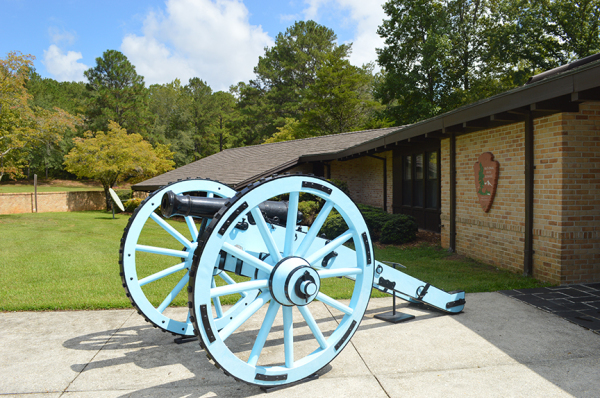 Horseshoe Bend National Military Park is open daily from 8 a.m. to 5 p.m. and is free to visit. Please click here to visit the park’s website for more information. U.S. authorities ordered three armies to converge on the Creek Nation. Two of these, marching from the Mississippi Territory and Georgia turned back after significant battles due to supply shortages. The third, from Tennessee, remained in the field through the sheer willpower and determination of its commander, Tennessee militia general Andrew Jackson. Fighting a series of major battles with Red Stick warriors, Jackson, and his men slowly pushed south through the mountain and hill country of Alabama. The Red Sticks fortified the narrow neck of a looping bend of the Tallapoosa River as the Tennessee army advanced. They called the place Tohopeka (“Horse’s Flat Foot”) because it was shaped much like a horseshoe. U.S. forces called it Horseshoe Bend. Jackson first tried to reach Tohopeka in January 1813 but was driven back by Red Stick warriors under Menawa, Francis and Peter McQueen at the battles of Emuckfaw and Enitochopco. Reinforced by the newly formed 39th U.S. Infantry, he tried again in March 1814. The army came within sight of Horseshoe Bend on the morning of March 27, 1814. 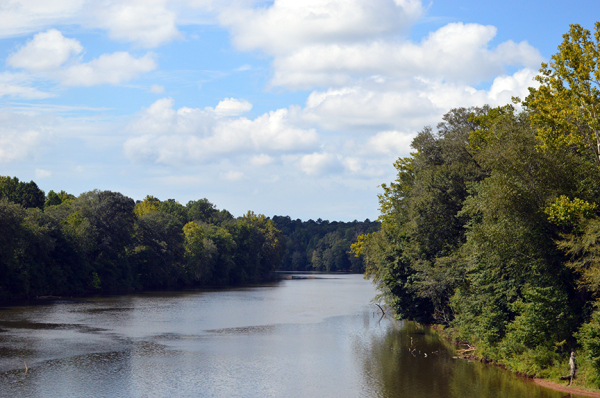 Jackson sent Gen. John Coffee and a large force of Cherokee, white-allied Creek and Tennessee militia fighters to cross the Tallapoosa River and surround the bend from the opposite bank. They were ordered not to let anyone escape. The noted Cherokee scholar and explorer Sequoyah was part of this force. He is remembered today as the developer of the Cherokee Alphabet. The general’s main force now closed to within artillery range of the Red Stick fortifications. Soldiers dragged two cannon to a hilltop overlooking the defenses and “Old Hickory” gave the order for the guns to open fire. It soon became apparent that the bombardment was useless. The Red Sticks had built double walls of heavy logs that zigzagged across the neck of the bend, and the iron cannonballs proved ineffective against them. The success of their fortifications inspired the warriors, and they now called out challenges and taunts to Jackson’s troops. On a hilltop behind the barricade, Red Stick prophets could be seen dancing to inspire their people to the fight. His cannon having proved ineffective, Jackson pondered his next move. As the impasse developed along the main lines, however, a portion of the Native American force sent to the opposite bank of the Tallapoosa under Gen. Coffee turned the tide of the battle. Cherokee warriors and some Tennessee riflemen swam the river to the Creek village in the foot of the bend and secured canoes. More troops were ferried over and Coffee opened a second front in the battle. His men set fire to the village and then advanced to open fire on the Red Stick forces from behind. The sudden appearance of Coffee’s men and the smoke rising from their burning homes forced Menawa’s warriors to weaken their front to fight the force attacking them from the rear. Seeing this as an opportunity to storm the barricade, Jackson ordered forward the regulars of the 39th Infantry. The firing and fighting were intense. Maj. Lemuel Montgomery led his men across the open ground to the barricade. The soldiers stormed the works and charged into the ranks of the Creek warriors beyond. Ensign Sam Houston, who later gained fame at the Battle of San Jacinto during the Texas Revolution, was severely wounded. Maj. Montgomery died in the fighting. Horseshoe Bend National Military Park. Coffee's men crossed the Tallapoosa River from the right bank to the left, setting fire to Tohopeka and attacking the Red Sticks from behind. 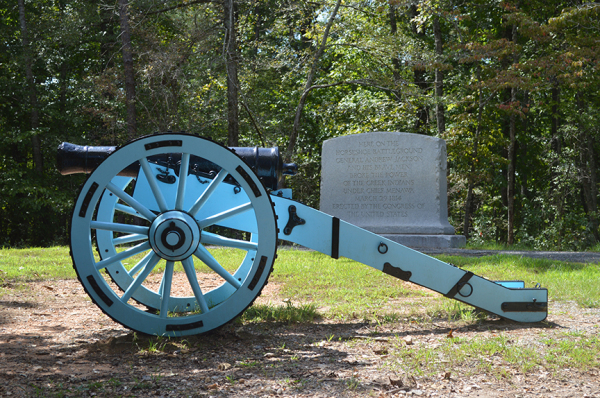 Special event: The park will observe the 205th anniversary of the Battle of Horseshoe Bend on Saturday, March 23.